Driving is an essential part of life for many people. Most of them are taught how to drive in driving schools. As nowadays technology is evolving and most of the information can be found online, it would be a great choice for anyone who owns or works at driving school to popularize their company/facility by making a responsive website. Our team created this premium bootstrap template exactly for people like you! I would like to tell you why bootstrap themes are so important and what is so special about it. Bootstrap is an HTML, CSS and JS framework which has a mobile first approach. It allows a website to be responsive. Now, you might have a question about what exactly responsive means, if you are not that experienced in web development. Responsive is any website, that reacts to what device is a user using, the orientation of it and most importantly the screen size. 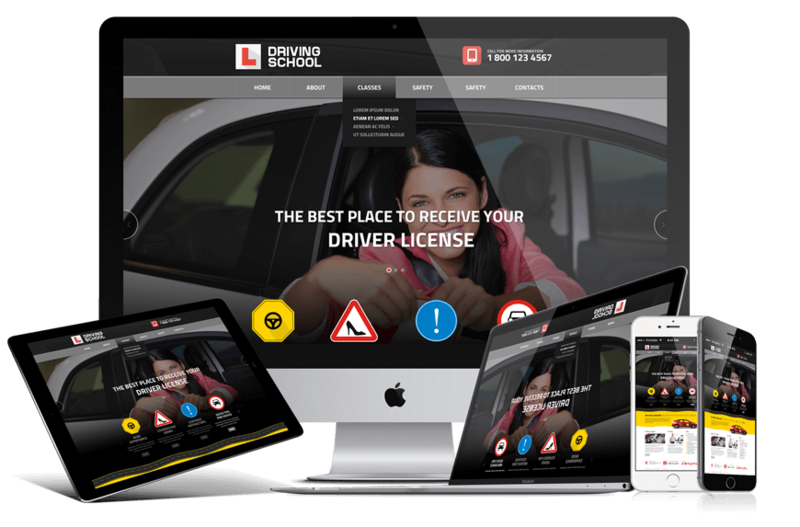 Responsive driving school template will fit any screen size and will look a beautiful and little bit different on each device to achieve complete perfectness. This premium theme allows you to make your website as informative as well as interactive. The homepage holds slideshow and brief information about your company. It also has the FAQ section on the right, so that people who have heard of you and would like to know more or have questions can directly see if anyone has already asked about it. Moreover, some of the courses that you offer can also be listed on the home page. However, as courses are the main point of the driving school, we created a special page dedicated to that called "Classes". Classes page holds information about each class along with a thumbnail on the left side to make it more expressive. We kept the contact section on each and every page to make it easier for your customers to reach you at any point when viewing the website. Although, this is not all. This bootstrap theme also has About page, where you can talk more about your company, its goals or mission. To make people more familiar you could also place your instructor photos along with little information in the middle section of the page. As driving's main threat is safety, we thought that it would be a good idea to have a page dedicated to it. You could use this page to talk about what safety guarantees you give to your customers or students. You could also put some pictures of your certifications if you want to show off any. Most importantly, the template has a gallery section, which has the ability to have different categories/albums. There is an option to bring all the pictures together of course. If you press each one of them, it will zoom. If you press arrows on your keyboard, you can switch from one picture to another. You can create as many categories and upload as many pictures as you would like. The website will change the design according to your needs.